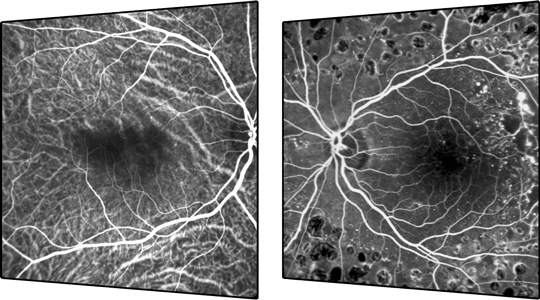 SPECTRALIS® scanning laser angiography can be conducted with either fluorescein or ICG dye. Both modes produce detailed, high-resolution images and video sequences that show vessel filling, flow, and leakage. For workflow efficiency and diagnostic precision, FA and ICGA can be acquired simultaneously and in combination with OCT imaging. 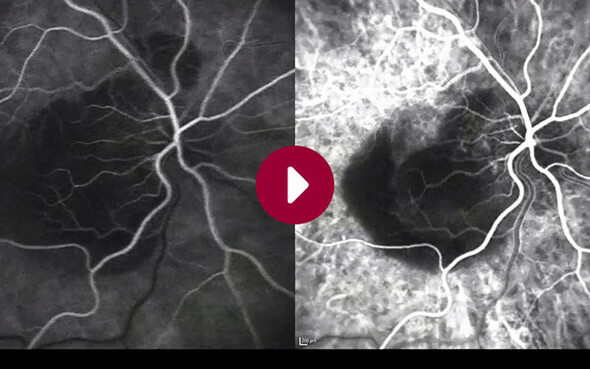 The optional Ultra-Widefield Angiography Module delivers scanning laser angiography images from the macula to the periphery for more comprehensive retinal examinations. Simultaneous FA and ICGA imaging with SPECTRALIS allows for a confident diagnostic of frequent retinal diseases e.g. choroidal neovascularization (CNV), central serous chorioretinopathy (CSCR) and pigment epithelial detachment (PED). With a SPECTRALIS scanning laser system a live fundus image can be acquired, for example a MultiColor image. Simultaneously acquired OCT scans are registered exactly to the fundus image with the Active Live Eye Tracker. The vessels in the OCT image and the fundus image line up perfectly. OCT scans can be acquired simultaneously with every imaging modality available on the SPECTRALIS.